People pay investment managers a lot of money to do one thing: Beat the market. The skills and expertise of fund managers are supposed to give them the ability to select better stocks and bonds than an index like the Dow or S&P 500. The problem is that hasn't been happening lately. A staggering 86% of active large-cap fund managers failed to beat their benchmarks in the last year, according to an S&P Dow Jones Indices scorecard released on Thursday. And no, that wasn't a one-off blip either. Nearly 89% of those fund managers underperformed their benchmarks over the past five years and 82% did the same over the last decade, S&P said. What's driving this phenomenon? At least some of the recent struggles of fund managers can be blamed on fallout from the market chaos of 2008. "The residue of the financial crisis made many investment managers risk averse. But you've gotten paid to take risk the past few years," said Nicholas Colas, chief market strategist at ConvergEx. The extraordinary post-crisis moves by the Federal Reserve have also created an unusual atmosphere where the markets tend to move all in one direction. For risky assets like stocks, that direction has been mostly up in the past six years. "That makes active managers' jobs much more difficult because you have to place very outsized bets on sectors you like to generate incremental return," Colas said. Big shift in investing: Investors are taking note that the high fees they pay a person to manage their money often aren't yielding better results. They've yanked money from so-called active stock funds every year since 2006, according to Morningstar. It's hard to blame them. Active funds get paid fees of 0.6% to 1% in exchange for selecting investments for their clients. Passive funds track an index or a basket of companies. While they may be less glamorous, they're also a lot cheaper than their more active peers. Fees are sometimes as low as 0.1% to 0.2%. Another sign of the great shift in investing trends is the explosion of ETFs (exchanged traded funds). ETFs typically track indexes, but they are even easier to buy into and sell out of -- similar to stocks. One such ETF, the SPDR S&P 500 ETF (SPY), recently became the second-most popular fund on the planet, leapfrogging nearly every single mutual fund. It's outperformed 80% of active mutual funds over the past five years, according to State Street, which runs the fund. Best of both worlds: So does all of this mean investors should dump all their active funds and run blindly into ETFs and other passive funds? Not exactly. The stock market is getting more volatile with a lot of ups and downs. That is the kind of environment that has traditionally been the best for active fund managers to shine. 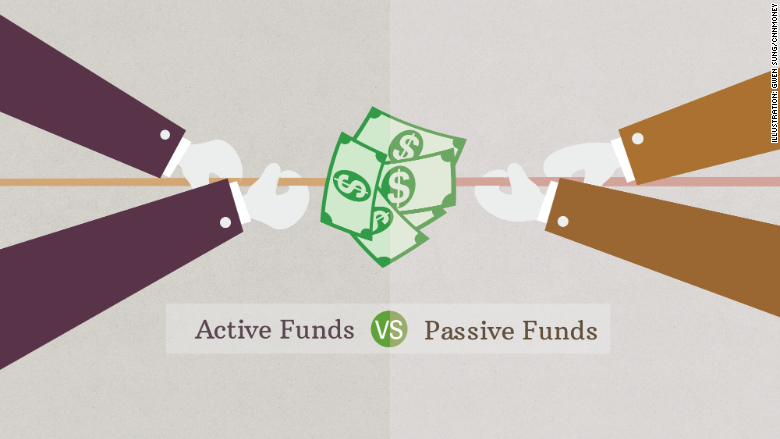 While the debate over active versus passive funds may be passionate, it doesn't have to be an all or nothing outcome for investors. "Fortunately, investors don't have to choose. You can have passive for core exposure like U.S. stocks and you can pick and choose among investors you think know what they're doing and have a better track record," Colas said.